It’s amazing to me that in this age of big data and automation programs that make our jobs a lot easier, many B2B marketers still don’t understand the fundamental buyer’s journey. It’s the only explanation I can think of when I scratch my head over some of the decisions marketers and sales teams make. Marketers fall into the trap of making our products and services the stars of the show, when in fact it’s our audiences who should be center stage. By failing to focus on hyper-personalization, B2B companies become susceptible to believing any number of common myths about their prospects, and poor performance follows. Quantity vs. quality is the biggest battle in B2B marketing, and lots of organizations are on the losing side. In our recent marketing maturity study 96% of marketers state that they want to focus on quality over quantity. However in that same study 93% state that they want to increase lead volume as well. Those two numbers don’t jive. If you’re using automation to blanket everyone on a long list with the same email content, over and over again, volume may result but the quality of your returns will diminish. There’s no template for outreach, no standardized form for lead nurturing – so don’t treat your prospects like nameless, faceless numbers. Buyers are skeptical of marketing messages, and they know when you haven’t done the homework needed to speak to their pain points and interests on an individual level. Don’t keep reminding them how out of touch you are by sending more and more irrelevant emails. Here’s the other great fallacy in the quantity/quality argument. Every organization has both a total addressable market (TAM) as well as an ideal customer profile (ICP). The delta between the two can be sizable. Certainly if you are selling a product or a solution with greater than 25k in annual contract value it makes more sense to employ an Accoutn Based Marketing approach and focus your efforts instead on a smaller set of data. Automation should help you drill deep, not wide. Certain behaviors indicate a likelihood of buying, or at least consideration. Narrowing the field won’t keep interested individuals on the outside looking in, but it will disqualify those who would have been a waste of time to pursue. Show me a company that places value on total leads generated, and I’ll show you a competitor snatching up all their qualified ones. 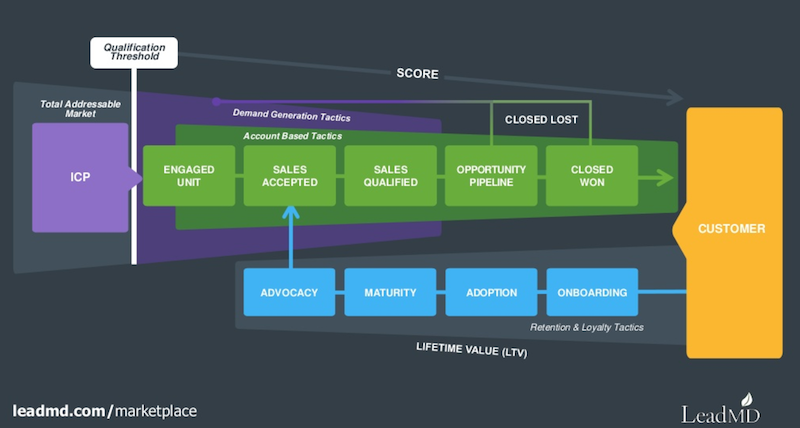 If ABM is the best fit for you, we’ve outlined a go-to-marketing framework that can help you. It’s the very model we use in-house at LeadMD. A good carpenter never blames his tools. A bad carpenter buys a shiny new hammer every year and wonders why his floorboards are still crooked. New technology isn’t going to make customers come to you all by itself, and trying to integrate new software with your current stack is going to make the whole thing topple over. Marketers are tempted by technology and the gap-fixing promises it brings. But most of the time, those same marketers don’t know why the gaps exist in the first place: they don’t understand the technology they already have. Before you create a software monster, take a couple steps back and ask yourself if you have a process that even needs enabling with technology – do you know your mission and your business objectives? Do you have the time and resources to evaluate, implement and train on new tech? Software is only as good as the people running it, not the other way around. Blogs, Twitter, Content: they’re not just for marketers anymore! As Jill Rowley would say, Account Based Marketing + Social Selling = Account Based Everything. Sales teams have unique perspectives on buyer behavior and needs that shouldn’t wait until deal conversations to be shared with the world. Marketing and sales can hop in the same pool together – don’t worry, neither will bite. Marketing has an obligation to keep sales informed on the types of prospects it’s targeting and the content that’s most effective so that a qualified account doesn’t feel like they’re starting over when engaging with a sales rep. Salespeople can proactively involve themselves in content creation, positioning themselves as valuable resources so they’ll be familiar to leads well before first contact is made. For a buyer, the journey should never feel like a series of fits and starts. It’s incumbent on your teams to work out a seamlessly connected plan to give a great experience. Everyone loves the thrill of the chase. What customers don’t love is being neglected after they’ve signed up with you. Don’t be forever tantalized by the thought of what’s next without growing the relationships you’ve already fostered. For one, current customers who feel well taken care of turn into loyalists who require less and less convincing to buy from you. They’ll also be your greatest advocates and word-of-mouth soldiers because of the product you offer and the customer experience you provide. If you disappear until conveniently springing up again a month ahead of your contract expires, acting all buddy-buddy and trying to earn a re-sign, your customers will see right through it. Work on a renewal nurturing program that keeps lines of communication open by sending relevant content post-purchase and even calling just to say hi. People are not robots. You cannot control them with your automation software and get them to act on your terms. Software can get the metaphorical horse to drink, but it can’t lead it to the water. Data gives you the insight on where your prospects have been and does its best to anticipate their next moves. But if you’re expecting everything to go as planned 100% of the time, you’ll be waiting for a train that never arrives. Automation hands you a wealth of information and allows you to reduce operational friction. Automation and CRM allow you to understanding what types of engagement work best no matter where your prospects choose to engage. The rest of the work you have to do on your own, in a highly personal format. That’s when the fun begins. ← Content Marketing ROI: Myth or Maxim?